*Up to a 55-65+ HP Gain! Better 1/4 mile track time! * Deep Race Car Rumble! *Exhaust runs 50% Cooler - Wow What a Difference! Full Belanger exhaust system. Best sounding, best quality, proven most powerful - exhaust system Replaces entire factory exhaust with performance exhaust headers, cat back , high flow cats, and new tips. Same exhaust as above except include full replacement exhaust tips. Runs much cooler than stock system. Headers, mid pipes, high flow - performance low heat Cats, O-2 sensor extensions, performance cat back system and improved exhaust tips. 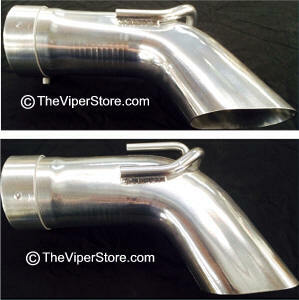 Improved Tips: Stock exhaust tips are too short and improperly placed so they drip and leave stains on your Viper rocker panel. These improved tips will not do that! 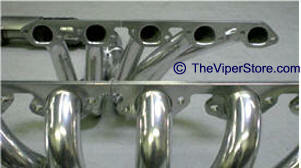 * Dyno tuned and track tested long tube Tri-Y Headers. * Laser cut 5/16" header plates. * run 50% cooler than stainless steel stock exhaust. * High temperature Jet Hot coating included. and your rocker panel. These IMPROVED Tips will not! This BEL-5560 system includes improved tips shown. Is your car an ACR? Which diameter do you want? 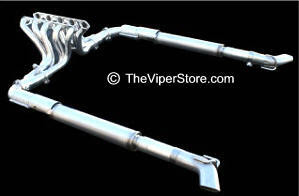 Full Cat Back with High Performance - High Flow mufflers for a Great race car Rumble. 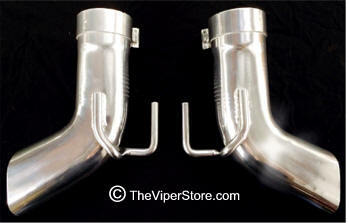 Specify 2.5" hook for stock exhaust and 3.0" hook up for aftermarket headers. 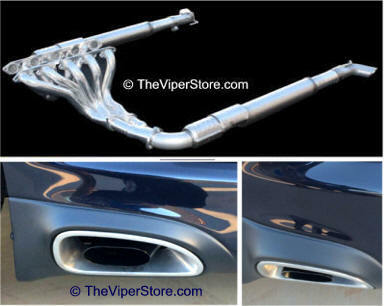 Choose silver or black tail pipes. Best Cat Back you can buy for your Gen 5 Snake. Up to a 15-20 HP Gain! 2.5 inch 3.0 inch NOTE: Stock is 2.5"
Note: stock exhaust is 2.5"
*Up to a 50-55+ HP Gain! Better 1/4 mile track time! Belanger system Hooks up to factory Cat-back exhaust. 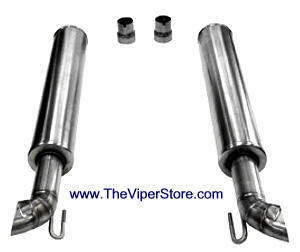 Best sounding, best quality, proven most powerful - exhaust system you can buy. 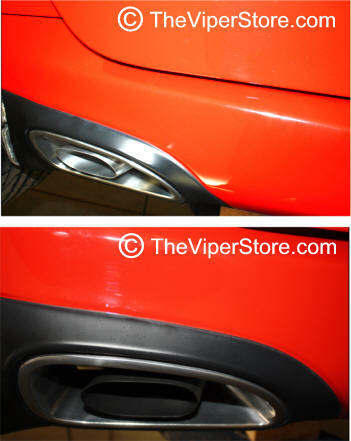 Fits to your factory catback or any aftermarket catback you choose. This Exhaust runs much cooler! 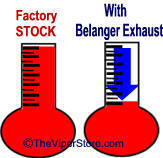 Belanger performance exhaust has been in business for over 50 years. All they make are the world's best exhaust systems specifically for the Dodge Viper. The number one brand used in Viper racing! Strong 304 Stainless Steel will not rust or corrode. 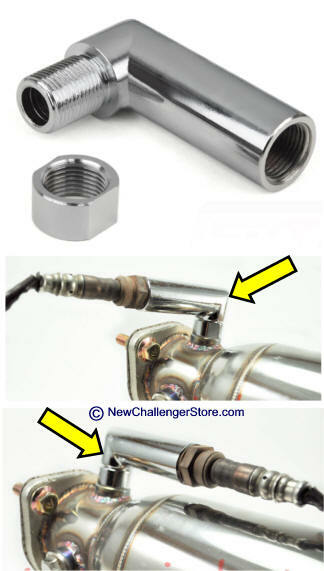 Choose 2.5" or 3.0" pipes after header. Does not include new tips. 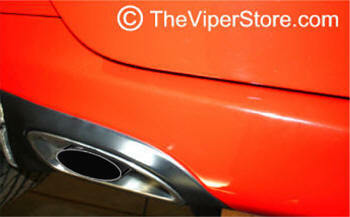 Belanger Viper Tailpipes with oval tips - slip fit tip kit. Great look and won't leak on to your rocker panels like the factory ones do. Tips shown at different angles. Rectangle Shaped Shown above two photos. Aggressive and Deep, Race Inspired, the Xtreme Series Offers the Biggest Sound and a Deep Throaty Growl! Fits with Belanger Headers part number: BEL5561 above. Technology: CORSA's Patented RSC® Technology is designed for an AGGRESSIVE SOUND under acceleration and a DRONE-FREE EXPERIENCE during cruise. Every system is engineered specifically to each vehicle without drone while cruising. 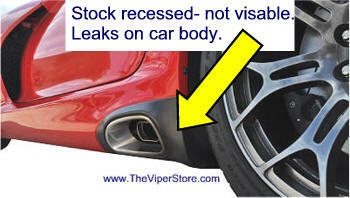 1:50 minute YouTube video of Viper with this exhaust. REALLY Cools down the HEAT into your cabin! For the Viper owner that wants to keep the stock exhaust but remove the two Rear restrictive Cats which create so much heat in the cabin. Slip fit on both ends to 2.5" stock exhaust. Your engine light will not come on as long as you install O2 simulators. It is a great product for cooling down your side sills dramatically. Comes with O2 down stream Sensor Bungs installed. 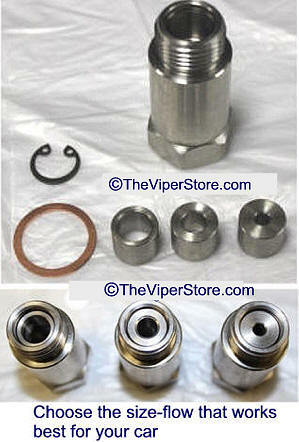 You will need a O2 Simulator (see products below) which is not included. 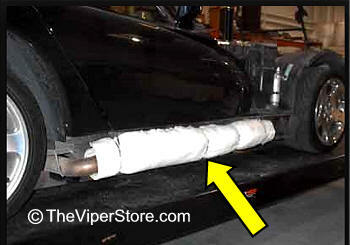 Best thing you can do to Cool Down your Exhaust for your Gen5 Viper! You're gonna Love these! O2-SIMSX2 Dodge Viper (2013-2017) Performance exhaust CAT O2 Simulator-Spacer - Stainless Steel!. Designed for off road racing use only. Takes less than 10 minutes to install this small O2 Simulator. Sticks out 2 inches from exhaust pipe. You will need a 2" clearance. If you have modified your Viper's system or installed performance CAT's or exhaust system you will get an engine code light on. About 99.9% time this tends to be the rear most O2 sensor at or after the CAT. With a modified or performance exhaust system the O2 sensor will receive a higher temperature and a higher flow rate than stock (unless you have tuned engine PCM). This is causing your engine controller to read that the exhaust system is out of balance throwing an engine light code. This O2 Simulator works by removing the troublesome O2 sensor from the direct exhaust flow and provide your engine controller with the expected exhaust balance - thus allowing your engine to run at its optimum. 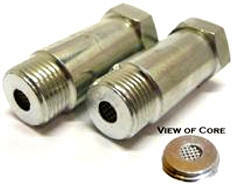 This O2 Spacer (Simulator) is screwed on to your existing O2 sensor and the assembly is replaced into the O2 bung (connection) on your exhaust. This is an easy inexpensive fix that is very easy to install. No soldering or splicing involved. NOTE 1: Requires a 2 inch clearance from your exhaust pipe. NOTE 2: You must have a working O2 Sensor and bung connection. Stop your Engine Light Code. Easy installation! O2-SIMS-90X2 Dodge SRT Viper (2013-2017) Performance exhaust CAT O-2 '90° LOW Profile' Simulator-Spacer - Stainless Steel! . Designed for off road racing use only. Extreme Low Profile Banjo Style Right Angle Spacer, Mounts in Any Direction. Takes less than 10 minutes to install this small O2 Simulator. Sticks out 1 inch from exhaust pipe. You will need a 1" clearance. Designed for narrow space exhaust pipe. The O-2 Sensor will mount at a right angel from your exhaust pipe. Takes less than 10 minutes to install this small O2 Simulator. This O2 Simulator works by removing the troublesome O2 sensor from the direct exhaust flow and provide your engine controller with the expected exhaust balance - thus allowing your engine to run at its optimu Dodge Viper (2013-Current) HIGH Performance Headers & 3" High Flow Cats exhaust system sensor and the assembly is replaced into the O2 bung (conn499.00n) on your exhaust. This is an easy inexpensive fix that is very easy to install. No soldering or splicing involved. NOTE 1: Requires only a 1 inch clearance from your exhaust pipe. Designed for tight spaces around exhaust pipes. O2-SIMS-ADJX2 Dodge Viper SRT-10 (2013-2017) Performance exhaust CAT O2 Simulator-Spacer - Stainless Steel! ADJUSTABLE. Fits all models. Used when Cat's are removed. Designed for off road racing use only. This version is adjustable. 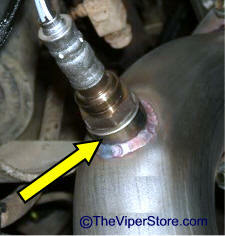 You can change heads to adjust the air flow to more tightly tune to your specific car and exhaust system. Comes with three different size air flow diameters. Try each see works best for you. If you have modified a Viper's system or installed performance CAT's or exhaust system you will get an engine code light on. About 99.9% time this tends to be the rear most O2 sensor at or after the CAT. With a modified or performance exhaust system the O2 sensor will receive a higher temperature and a higher flow rate than stock (unless you have tuned engine PCM). This is causing your engine controller to read that the exhaust system is out of balance throwing an engine light code. Adjustable flow rate! Comes with different flow 3 nozzles. O2-CAT-SIMS-X2-Disc Dodge SRT Viper (2013-2017) Performance exhaust Deluxe Mini CAT Mechanical Simulator-Spacer -Stainless Steel! . Designed for off road racing use only. Designed for the tough oar complicated performance exhaust jobs that need that extra bit - to trick your sensors. Contains Platinum Rhodium Ceramic Core (Cat Material) Insert. Made in America Stainless Steel! 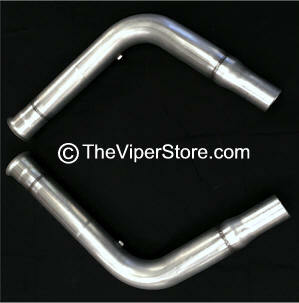 O2-ELBOWX2-Disc Dodge SRT Viper (2013-20107) Performance exhaust O-2 Angle for Simulator-Spacer - Stainless Steel!. Designed for off road racing use only. 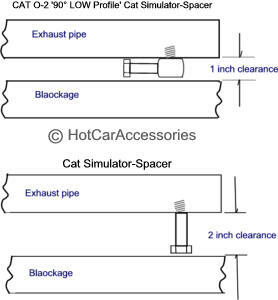 Add to any Straight Spacer or Mini Cat to convert it to a 90 degree Angle. 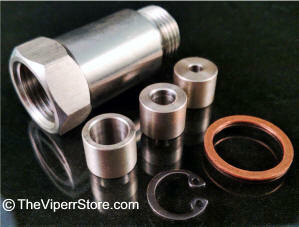 Screw any of our spacers into this elbow and reduce the clearance of your spacer from 2 inches to 1 inch. 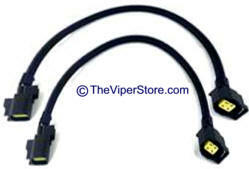 Designed specifically to fit the Dodge Viper in each particular year group with correct plugs. Heat resistant. Choose year group to get correct length. 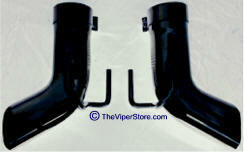 FSI-SSI-V3 Dodge Viper (2013-2017) Side Sill Insulation Kit - COOL your sills!